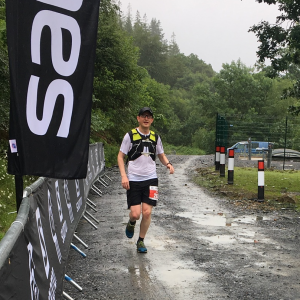 Jon Mould reports: As the first instalment of this summer’s trail running double-header approached, I was feeling quietly confident that I would have a good race on the forest trails of Coed-y-Brenin. Following the abject misery of the last October’s Birmingham Marathon (where I fell apart halfway through and my wife has later said that she considered suggesting I pull out because I looked so bad!) my running since then had been the most consistent ever, managing to run regularly without colds or niggles holding me up for the majority of the previous six months. I’d managed four long runs over 20 miles on the up and down trails of the Lickey Hills and the South West Coast Path and at the end of the day I was using this as my longest training run for the Ultimate Trails 55k in three weeks’ time, so I whilst I had a loose time-goal in mind, I told myself I didn’t really mind how long it took me. Race day dawned bright and early (5.15am alarm!) and I was greeted by pouring rain outside the window, which continued for most of the drive over to Snowdonia and the majority of the race. After collecting my race number and the customary photo by the portaloos, I was soon listening to the race briefing and crossing the starting line. 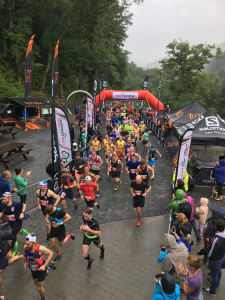 The first half of the marathon is the same course as the half-marathon so anybody who has been over there before will know that it is all uphill for the first couple of miles and narrow switchbacks in places. When I had run the half previously, I had been guilty of going off far too fast up the hill and really struggling with the constant uphill gradient, so I aimed to relax and take my time. After all, a marathon cannot be won in the first few miles and I didn’t want to suffer more than I had to later on. I managed to stay relaxed and easy for the first three miles, but on a sustained downhill between three and four miles I found myself ‘racing’ in a group of people where I was comfortable at the time but knew if I continued I would pay for it towards the end of the race. Inspired by the recent Marathon Talk interview with Steve Way, who finished 3rd at Comrades this year and consciously decided to step back from the lead group of elite runners, only to work his way back and overtake them in the closing stages, I deliberately slowed my pace. 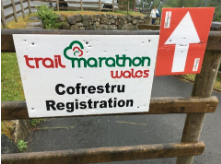 This meant that for much of the first half of the race I was running on my own, only seeing a few other runners and marshals, but I actually enjoyed the peace and quiet of this and it was a good chance to enjoy the beautiful surroundings of Coed-y-Brenin. My favourite part of the first half was definitely the downhill single-track but I wish my shoes had slightly more grip so I could fully commit to them. When I did the half-marathon last year I had face-planted twice on these sections so I was understandably a bit more cautious, but it was very enjoyable running hard downhill and dodging branches, rocks and tree roots on the way. The midpoint of the marathon comes back to the Trail Running Centre where the race starts and I reached halfway in around 1:57, incidentally the same time I had finished the half-marathon in the previous year. I was a bit concerned that I had gone off too quickly but I was feeling good, and after seeing my wife and a brief stop at the fueling station I carried on for the second half of the race. This goes under the road and up the opposite side of the valley, a part that I hadn’t been to previously so I was looking forward to what was in store. By this point in the race, I had begun to catch a few runners and my competitive edge fully kicked in when I saw a BRAT vest up ahead. We had a brief chat as I caught him but then I was more than determined to work hard in the second part of the rest. It felt like there was much more uphill in the second half but I continued to push on. I was trying to increase my cadence and shorten my stride length on the uphills and only walk where it got too steep, as this had served me well at the Coniston Trail Marathon last year. Although it was just supposed to be training run, I couldn’t help myself racing and started trying to calculate potential finish times. I was trying to maintain 9 minute miles on the flat, go as far under that as I could on the downhills without falling over, and not go slower than 12 minute miles on the ups. I had a bit of a wobble on an uphill in mile 19, but this soon passed. As I got into the final six miles of the race, I was still feeling strong and catching and passing people every so often. Continuing with my time calculations, I was concerned at mile 21 that I would not finish under 4 hours (my A-target for the run – yes I know I said I didn’t really mind how long it took!) because the mile took me around 15 minute to complete as I was forced to walk a lot due to the steep rocky nature of the path. However, with the last couple of miles being predominantly downhill I managed to up my pace and finished in 3:51:58 which I was really pleased with. This was much quicker than the 4:15 trail marathon I’d done in Coniston the previous year and interestingly for me, 2 minutes quicker than my time at the Birmingham Marathon. Given that this race had 4000 feet of climbing in it, it shows just how rough a day that was! I worked out afterwards that in the second half of the race I overtook 15 people while only being passed myself once. I think I definitely made the right decision taking the first half slightly easier and dropping off that group because it gave me the energy and enthusiasm to work hard and push on in the second half of the race. On reflection, I might have ‘raced’ this a bit hard given that it was a training run for the Ultimate Trails, but I’ve got a few weeks to recover and I have no real time expectations for that race (I say now! ); I just want to have a good day out in the Lake District. 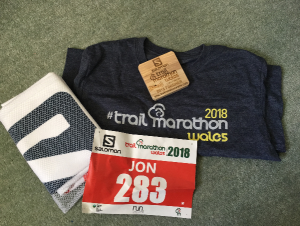 I would highly recommend the Trail Marathon Wales to anyone who likes the hills and a bit of variety in running surface with trails, single-track and forestry roads. It’s really well-organised with plenty of feed stations, marshals and a well-marked course which is easy to follow. It is definitely a tough marathon, but it is very rewarding too and you get a free t-shirt, coaster and microfibre towel for your troubles! This entry was posted in Marathon, Race Reports, Trail by BvH Admin. Bookmark the permalink. Great report Jon. My new favourite thing in trail races is to start at the back and work my way through. When it’s a tough race, passing anyone is such a boost!